After one year of building a free, democratic and inclusive society, the citizens of the Republic of South Sudan today celebrated the first anniversary of their independence. On 9th of July 2011, South Sudan, Africa’s 54th nation was born. Millions of people celebrated a new national identity and new national promise. At DC today, US Secretary of State Hillary Rodham Clinton send her best wishes to the people of the Republic of South Sudan as they celebrate their independence. Ms. Clinton says South Sudan has been hard at work over the past year building governing structures and a foundational legal framework. Despite the progress, significant challenges remain that threaten stability and prosperity, she highlighted. Conflict and unresolved issues with Sudan and domestic inter-ethnic tensions have led to increased fighting and economic hardship, which threatens to compromise the very foundation on which South Sudan’s future will be built, Ms. Clinton highlighted. The US government is hopeful that this new beginning for the people of South Sudan will continue to be used as an opportunity to build a nation that embodies the values and aspirations of its people, and that South Sudan can emerge from the shadows of conflict and turmoil, Ms. Clinton stressed. The United States remains committed to helping South Sudan meet the challenges it faces and build a free, democratic and inclusive society, one that is at peace both internally and with its neighbors, Ms. Clinton said. She stresses that the strong ties between the people of the two nations go back many decades. Both nations are committed to building upon this partnership in the years to come as well. Earlier this May, South Sudan has recently completed withdrawal processes of its police forces from the disputed Abyei to comply with the United Nations Security Council resolution endorsing roadmap of the Africa Union Peace and Security Commission. South Sudan is reportedly willing to comply with all aspects of resolution 2046, which calls on both sides to resume negotiations on post-partition issues and signed pact with three months. The United States of America also welcomed the redeployment of all Republic of South Sudan Police Services out of the Abyei Area. Earlier this year, South Sudan’s military involved in the attack on and seizure of Heglig, home to Sudan’s largest remaining source of oil following the South’s secession. Military clashes have erupted in the border region of Sudan and South Sudan in March this year. Media reports say South Sudan accused Sudan of sending warplanes to bomb two border areas. Meanwhile, Sudan accused the southern army of attacking the oil-producing Heglig region wherein parts of which are claimed by both warring nations. For more than two decades, Sudan has been riven by intense fighting over land and resources. However, the security situation in the disputed area of Abyei remains fragile, with both South Sudan and Sudan failing to withdraw their armed forces as agreed under a demilitarization pact reached in June 2011. 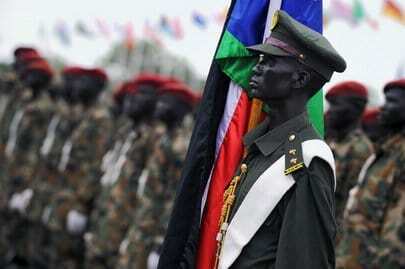 South Sudan became independent from Sudan on 9 July. A referendum on the status of the Abyei area on the border was to have been held in January this year, but never took place amid disagreement on voter eligibility. Dozens of people have been killed this year as a result of clashes in Abyei and surrounding areas and tens of thousands of have been forced to flee their homes.